We Must Protect This Hole! What's more intimidating to a golfer than a putt-putt windmill? Try Testudo on for size. 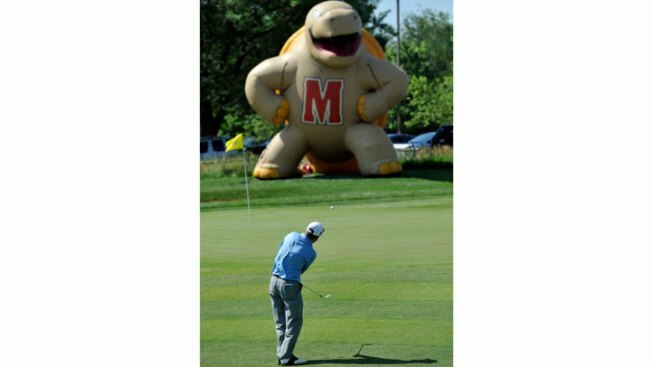 The Terp mascot loomed large on Thursday at the Melwood Prince George's County Open at the University of Maryland Golf Course. Just ask Craig Bowden, who had to avoid this rather large distraction why chipping onto the 18th green. Bowden ended up with a par on the hole and finished his first round with a 1-over 72. Canadian Chris Baryla grabbed the first-round lead in the Nationwide Tour event by shooting a 7-under. And if you're wondering, Dicky Pride was three shots off the lead. The tourney continues through the weekend with live coverage being shown on The Golf Channel.